Topological defects have recently become of great interest in condensed matter physics, particle physics and cosmology. They are the unavoidable remnants of many symmetry breaking phase transitions. Topological defects can play an important role in describing the properties of many condensed matter systems (e.g. superfluids and superconduc- tors); they can catalyze many unusual effects in particle physics models and they may be responsible for seeding the density perturbations in the early Universe which de- velop into galaxies and the large-scale structure of the Universe. Topological defects are also of great interest in mathematics as nontrivial solutions of nonlinear differential equations stabilized by topological effects. 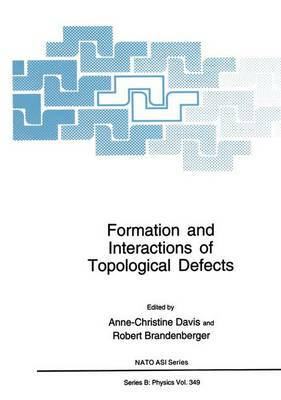 The purpose of the Advanced Study Institute "Formation and Interactions of Topo- logical Defects" was to bring together students and practitioners in condensed matter physics, particle physics and cosmology, to give a detailed exposition of the role of topo- logical defects in these fields; to explore similarities and differences in the approaches; and to provide a common basis for discussion and future collaborative research on common problems.